MONROVIA, Calif. – At their September meeting last night, the Foothill Gold Line Construction Authority board of directors unanimously voted to award a $2.6 million Utility Relocation design-bid-build contract to W.A. Rasic Construction Company, Inc. for the utility relocation work as part of the 12.3-mile Foothill Gold Line light rail project from Glendora to Montclair. The contract award will allow the Foothill Gold Line Construction Authority (Construction Authority) to begin work on the $1.4 billion, six-station Glendora to Montclair segment in October, with the first three years being spent relocating utilities, conducting pre-construction activities, finalizing engineering plans and hiring the design-build contract team. Stakeholders can expect minimal construction impacts during this phase of initial work. 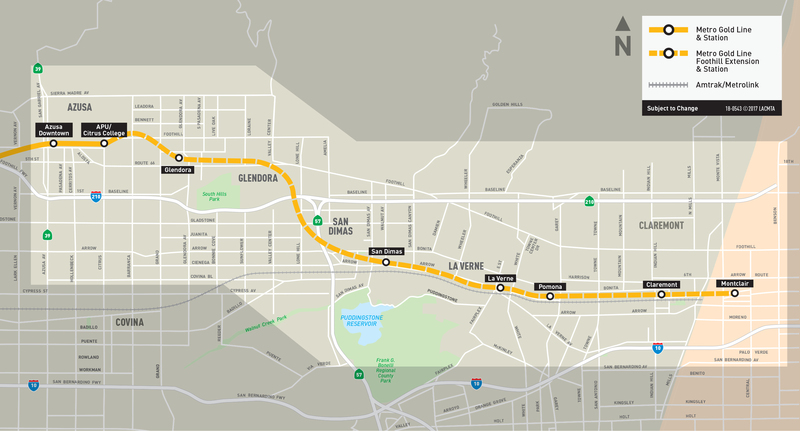 The Glendora to Montclair segment will extend the Metro Gold Line light rail line from its eastern terminus in Azusa through the foothill communities in the San Gabriel Valley and into San Bernardino County. It will add new light rail stations in Glendora, San Dimas, La Verne, Pomona, Claremont and Montclair. The project is being funded by Los Angeles and San Bernardino Counties. The portion of the project within Los Angeles County (Glendora to Claremont) is being mostly funded by Metro’s Measure M half-cent sales tax that was approved by voters in November 2016 and went into effect on July 1, 2017, as well as residual Measure R funds from the Pasadena to Azusa segment that was completed under budget and other funds. The portion from Claremont to Montclair is being funded by San Bernardino County. The Utility Relocation contract is the first of two contracts to be procured as part of the Glendora to Montclair project. The second, Alignment design-build contract, will begin procurement this November and anticipate award in late 2018. Major construction will begin in 2020 and consist of two major construction phrases: first, the relocating/rebuilding of the freight and Metrolink systems, and second, the construction of the Gold Line light rail system. Completion is expected in 2026. A video previewing the construction of the project can be found on the Construction Authority’s website at www.foothillgoldline.org. A public groundbreaking ceremony for the project will be held on December 2, 2017 at Citrus College. More details on the ceremony will be released by the Construction Authority in the near future. About the Foothill Gold Line Construction Authority – The Foothill Gold Line Construction Authority is an independent transportation planning and construction agency created in 1998 by the California State Legislature to plan, design and build the Metro Gold Line light rail system from Union Station to Montclair, along the Foothills of the San Gabriel Valley. The agency completed the first segment from Union Station to Pasadena in 2003 and the Pasadena to Azusa segment in 2015; both on time and under budget. The agency began work on the Foothill Gold Line from Glendora to Montclair in 2003. The Glendora to Montclair project was environmentally cleared in March 2013 under the California Environmental Quality Act (CEQA) and completed advanced conceptual engineering in 2016. Groundbreaking is set for December 2, 2017, with substantial completion anticipated in 2026. When completed, the extension will add new stations in the cities of Glendora, San Dimas, La Verne, Pomona, Claremont and Montclair. Ridership on the six-station extension is anticipated to exceed 18,300 boardings on weekdays by 2035. You are describing the Glendora-to Montclair segment. What is the current status of APU/CitrusCollege-to-Glendora link? There is none that I know of. The project will open at one time, from APU/Citrus to either Claremont or Montclair. They NEED to make the line go to LAX sister: Ontario Airport.